My husband’s from Texas, and we just flew back to visit his family and do some interviews for our company, CareerSighted. His dad and step-mom picked us up from the airport in Houston, and before driving back to their house, we decided to stop for dinner. My father-in-law suggested several restaurants, but as soon as we heard “BBQ” we were sold. 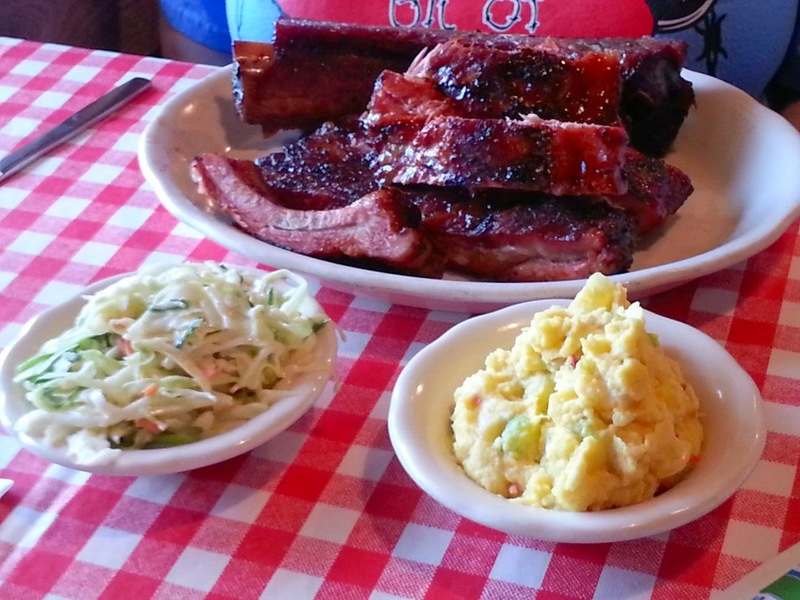 It’s hard to find good BBQ in Los Angeles, so we want to get our fill while we’re in Texas. 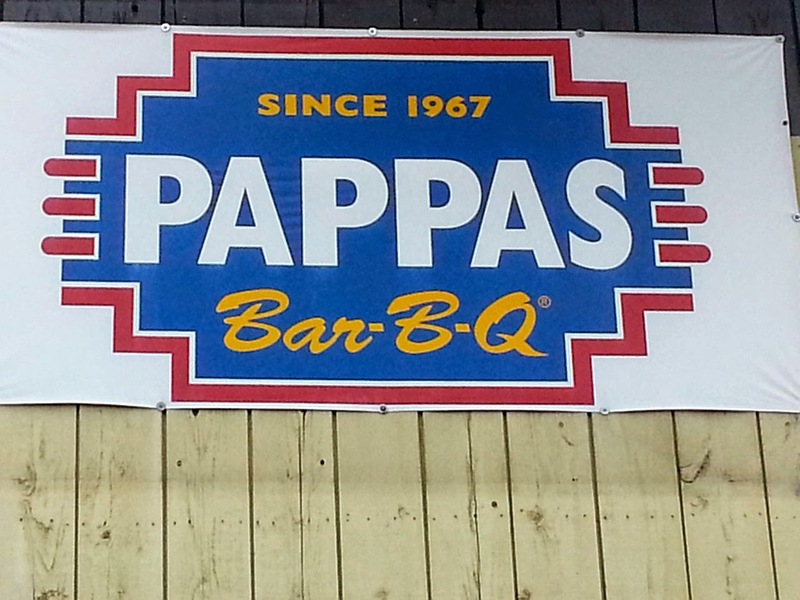 We drove over to Pappa’s BBQ. My husband and I had never eaten there before. You walk through a line and order your food. There’s a variety of pork, chicken, sandwiches and more. Almost everything comes with 2 sides. They fix your plate for you right behind the counter, so you hardly have to wait at all before you get your food. That’s great if you’re hungry! The servings are really big. My husband and I totally should’ve shared. 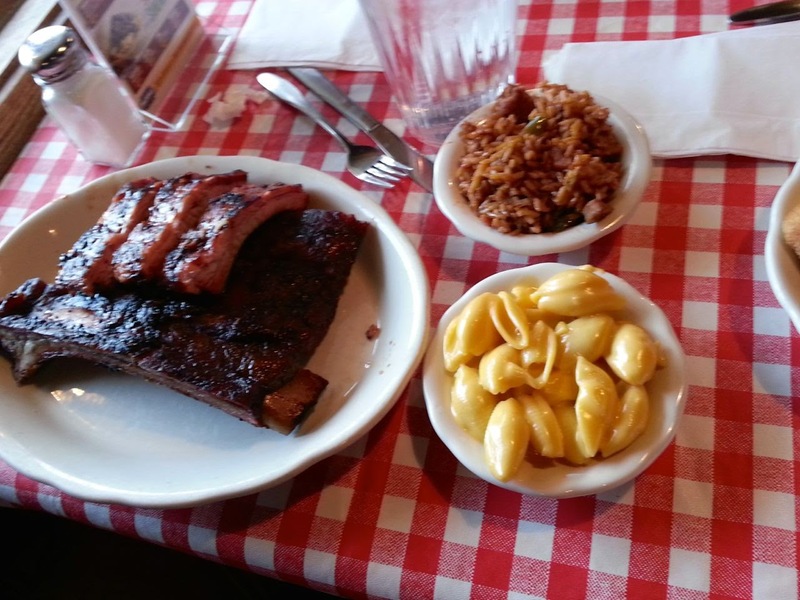 My husband ordered the Rib Combo, which comes with 1 beef, 2 pork & 3 baby back ribs plus his choice of 2 sides. For his sides, he got macaroni & cheese and spicy rice. 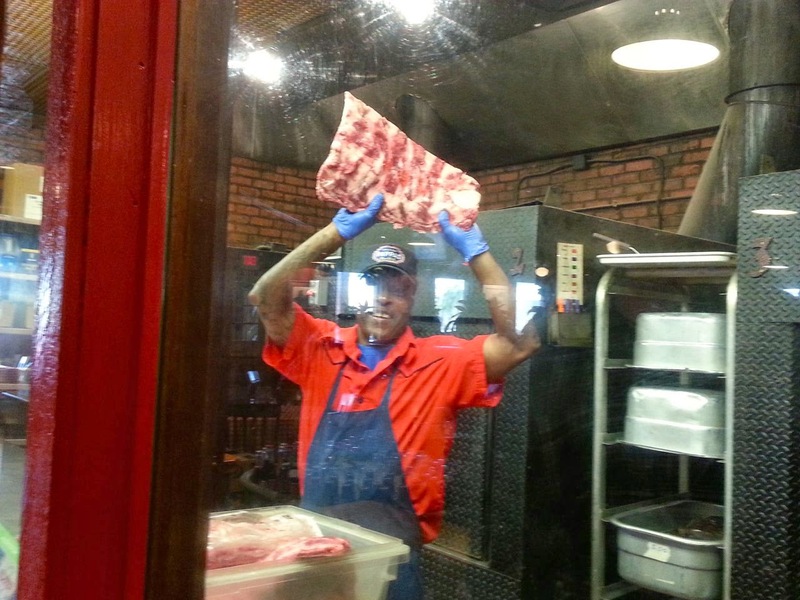 He loves ribs and raved about the ones at Pappa’s. The mac & cheese was actually shells & cheese and looked nice and creamy. I tasted his spicy rice just to see if it was actually spicy. It was spicy. I ordered the ½ chicken and pulled pork. I wanted to get green beans for one of my sides, but they were all out of green beans at that moment. Instead, I decided to trade in my two sides for a baked potato. The lady at the counter asked me if I wanted butter and cheese on it. I said just sour cream on the side, and she told me that sour cream is “on the bar.” I had her give me butter on the side. It was a huge potato, but the amount of butter she gave me (2 huge scoops) was still way too much. I’m definitely glad I asked for it on the side! At the fixins’ bar, I got sour cream and chives. There’s nothing I like better on a baked potato than sour cream and chives! The pulled pork was incredible. 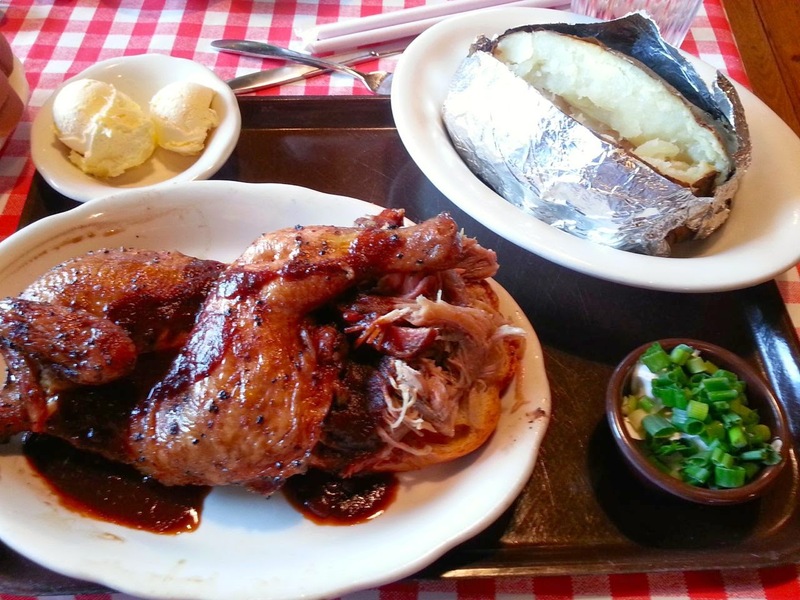 The chicken was good, but if I have the opportunity to go to Pappa’s again, I’m totally just getting pulled pork! 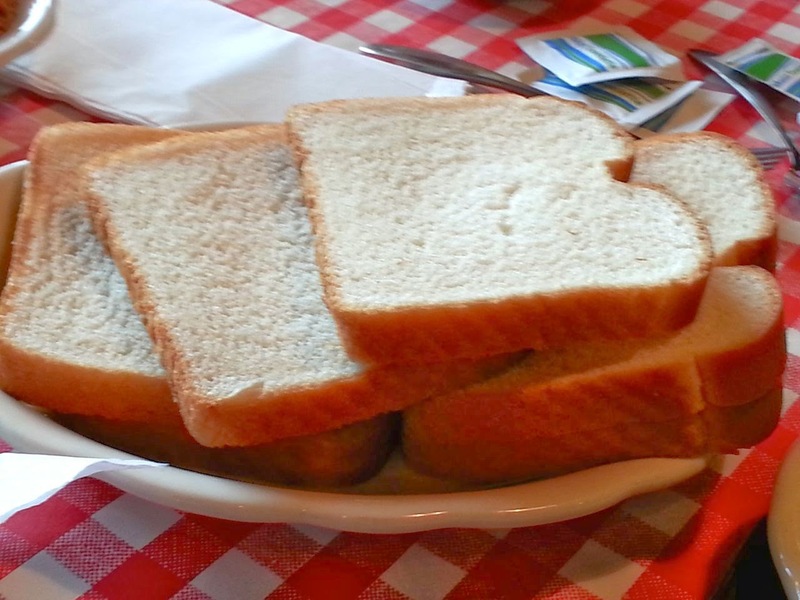 It was served over a slice of white bread which really soaked in the pork flavor and was sinfully delicious. My step-mother-in-law, ordered the rib combo. For her sides, she went with coleslaw and potato salad. It was a lot of food, so she brought a rib home for later. 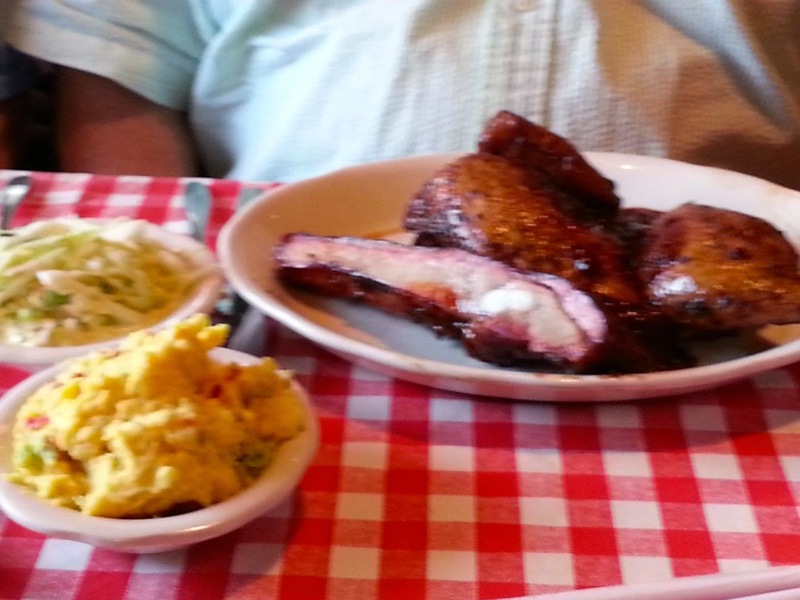 My father-in-law ordered the ½ chicken and ribs combo. For his sides, he ordered coleslaw and potato salad. He also asked for a plate of white bread which he ate with some of my extra butter. Maybe it was due to the bread, but he wasn’t able to finish his meal either. He brought half of the chicken home with him. 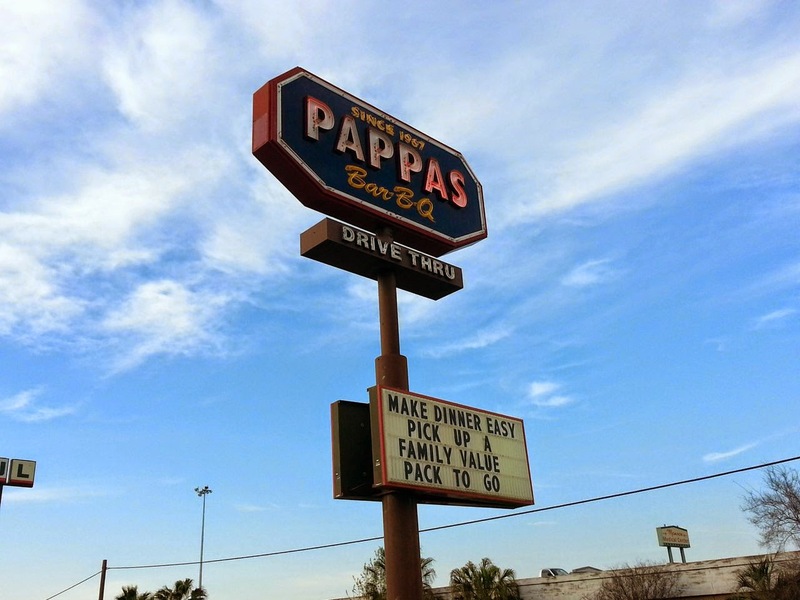 I hope it works out that we can eat at Pappa’s again before we leave Texas. It’s the best BBQ I’ve had in a very long time.